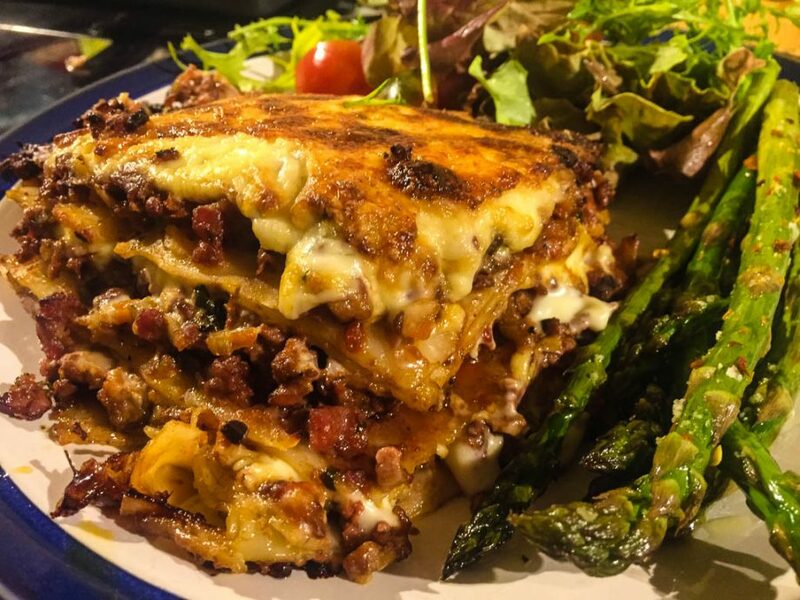 This lasagne recipe is an old favourite. I used to cook it regularly, and whilst it takes a bit of effort, we’d comfortably get three meals out of it for the two of us. It’s rather fallen off the radar a bit just lately though and it’s been a good while since I last made it. It’s an old friend though, it will be nice to see this one again. Over the years of making this, I’ve learned a few things about it. Most notably that the quantities are way out of kilter. If you follow the quantities listed, there’s slightly not enough ragù, and nowhere near enough béchamel. Maybe the size and shape of the dish I use just isn’t right, but whenever I follow the recipe quantities faithfully, I always run out of everything. So, I have an easy workaround. I double everything. 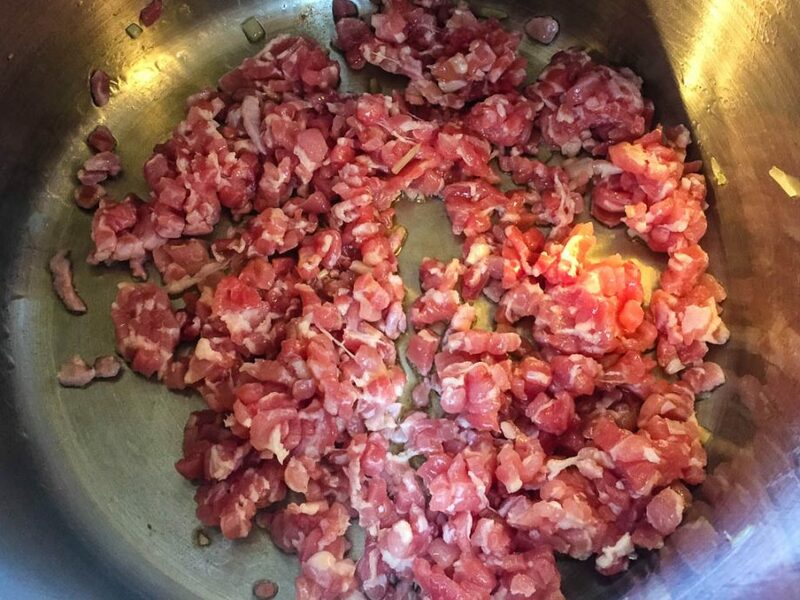 That does mean that I end up with a lot of leftover ragù, but that’s no bad thing – it’s delicious and very versatile. 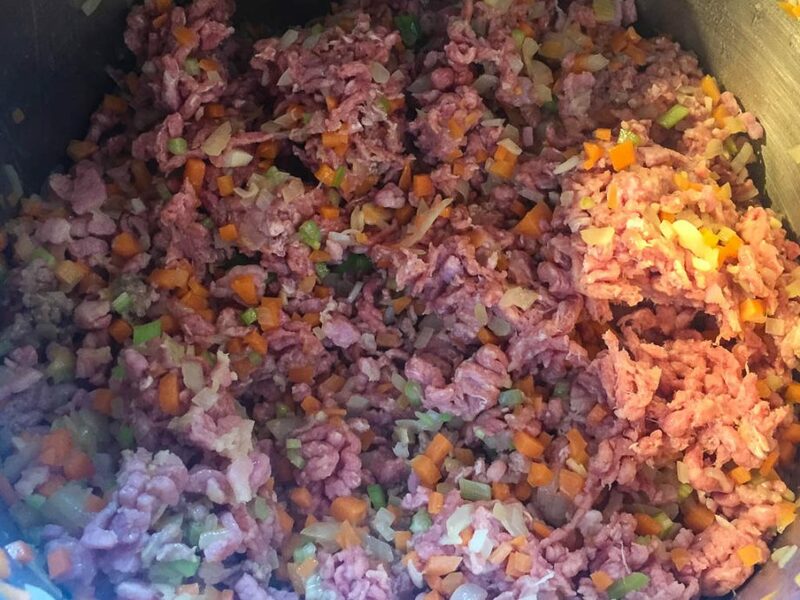 I can freeze that and serve it with pasta, or make a cottage pie with it at a later date. 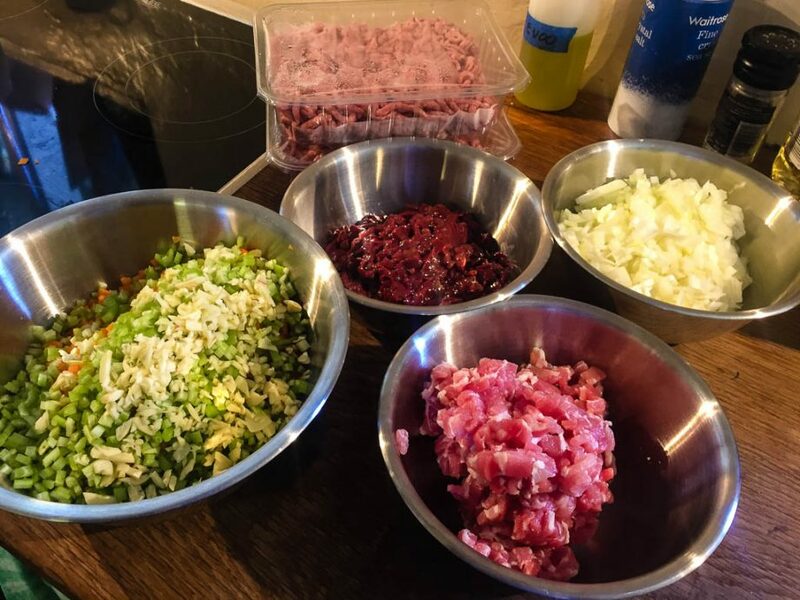 So, I start with the ragù. 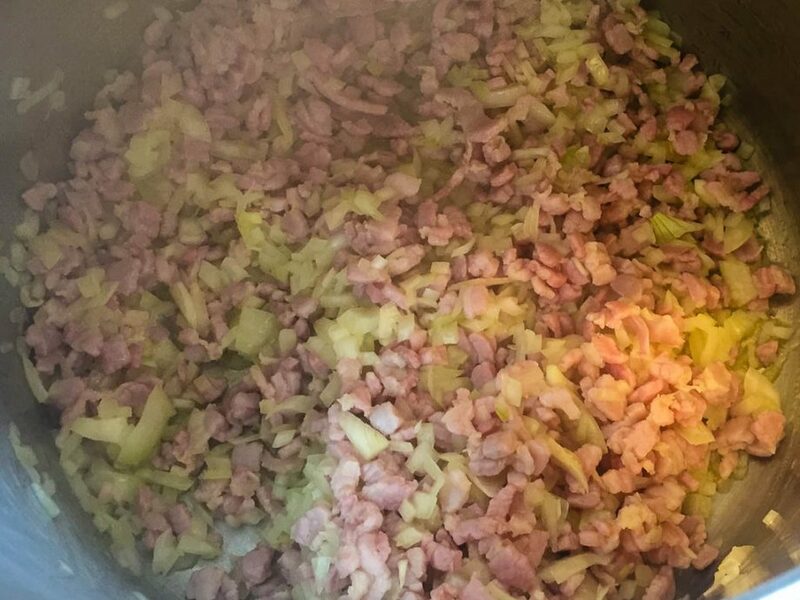 I fry some chopped bacon. 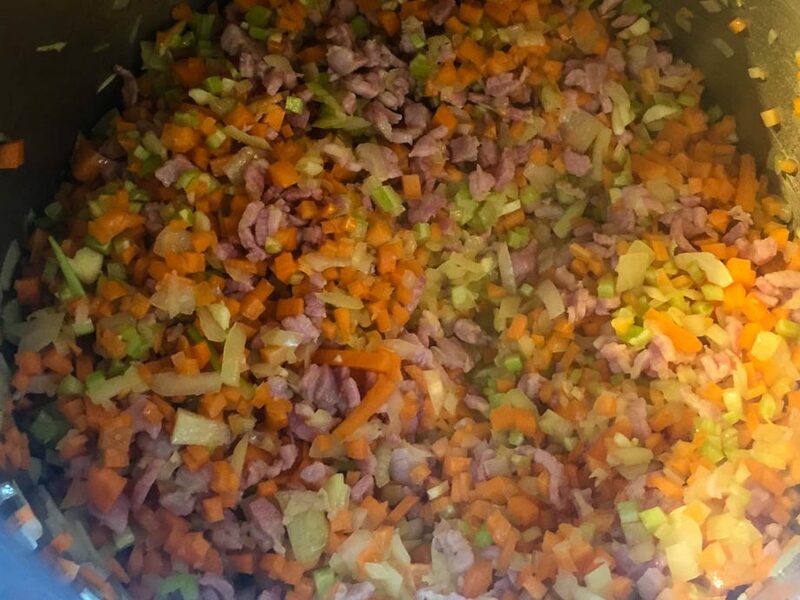 Then, garlic, carrots and celery. Tomatoes, wine, herbs, then season and simmer for an hour or so. Meanwhile, I make the béchamel. 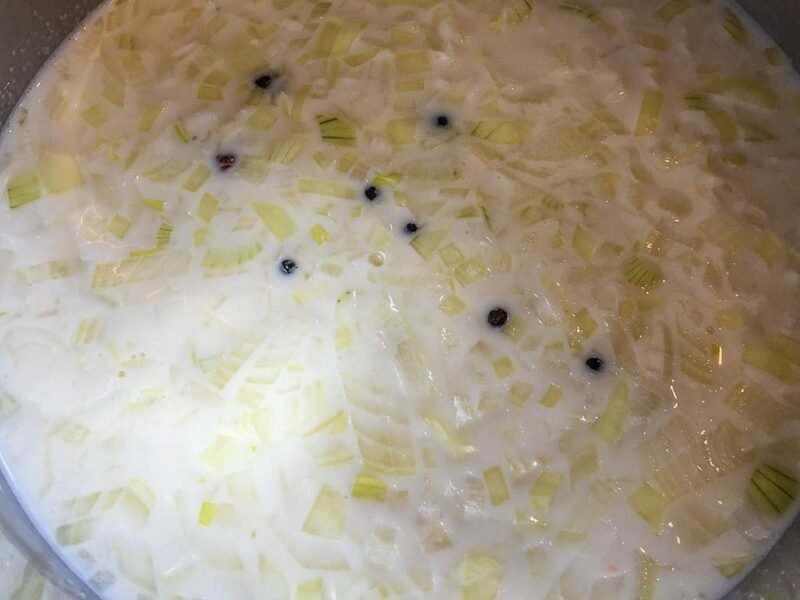 I simmer chopped onion, cloves, bay and peppercorns in some milk, and then leave to stand for a little while. Next, I make a roux. 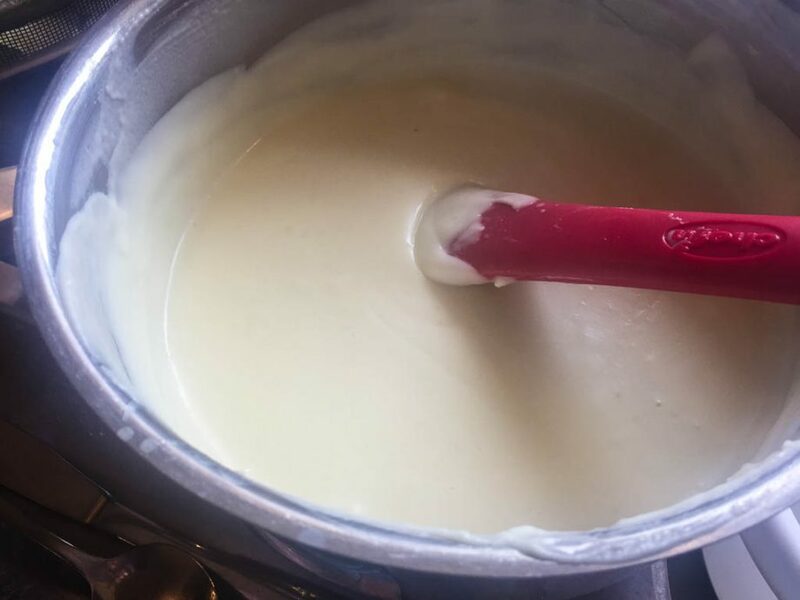 And mix in the strained milk to make a thick creamy sauce. 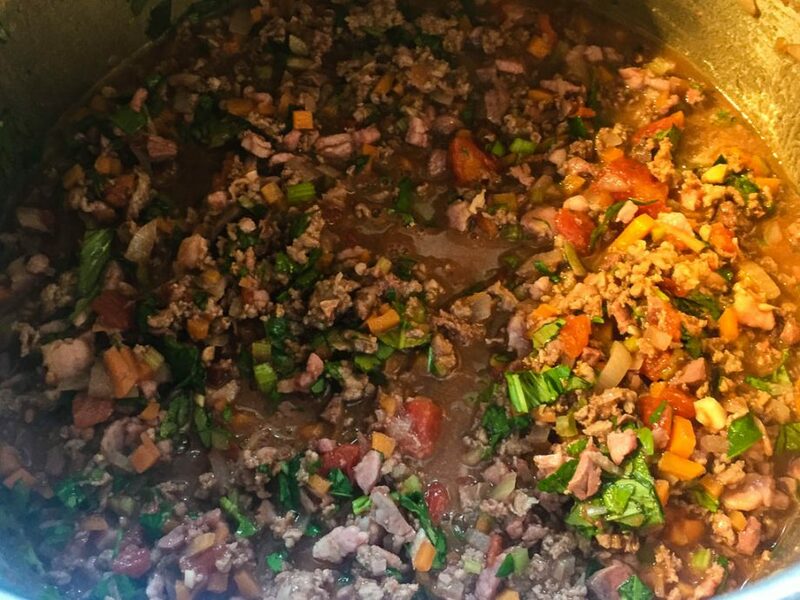 That simmers for a little while, then I stir in some cream and set to one side. 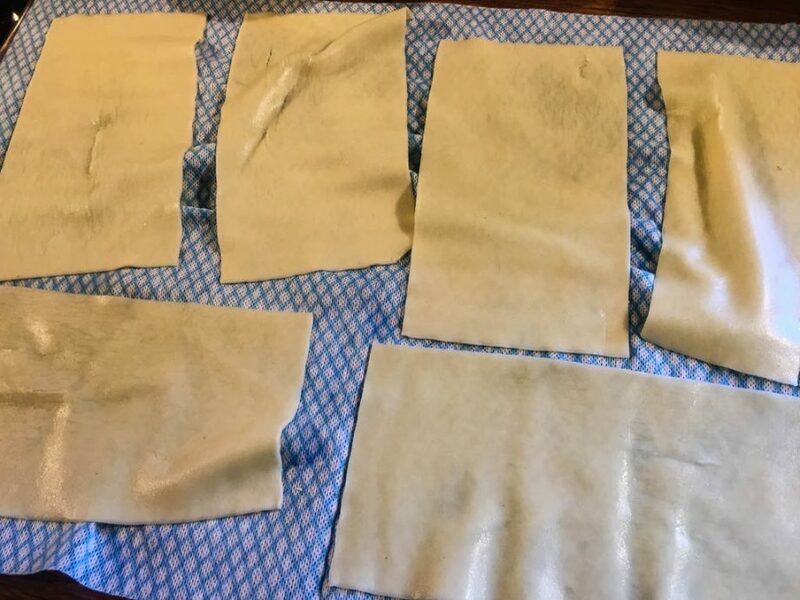 I cook the sheets of lasagne in a couple of batches until tender, and then leave them to drain and cool slightly. Now to construct the Lasagne al Forno. 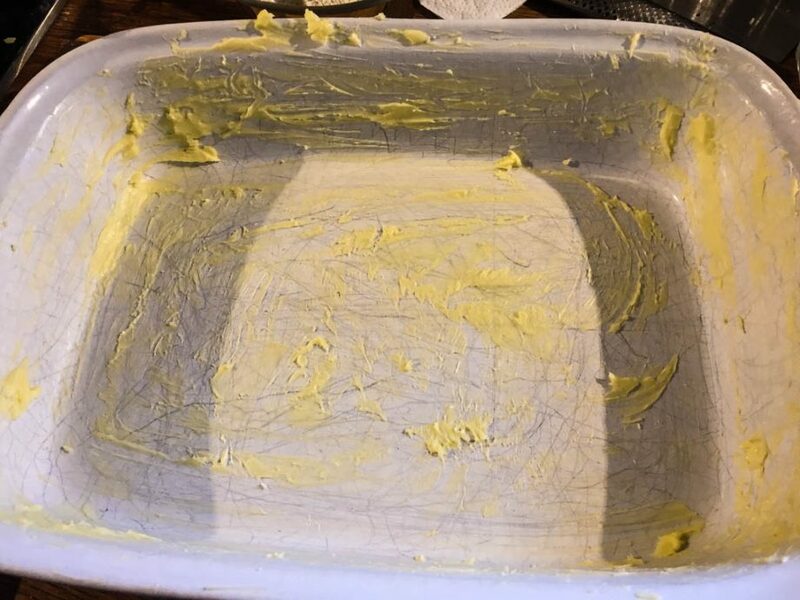 I start by buttering the dish. And repeat so that there are three of each layers, finishing with the béchamel. 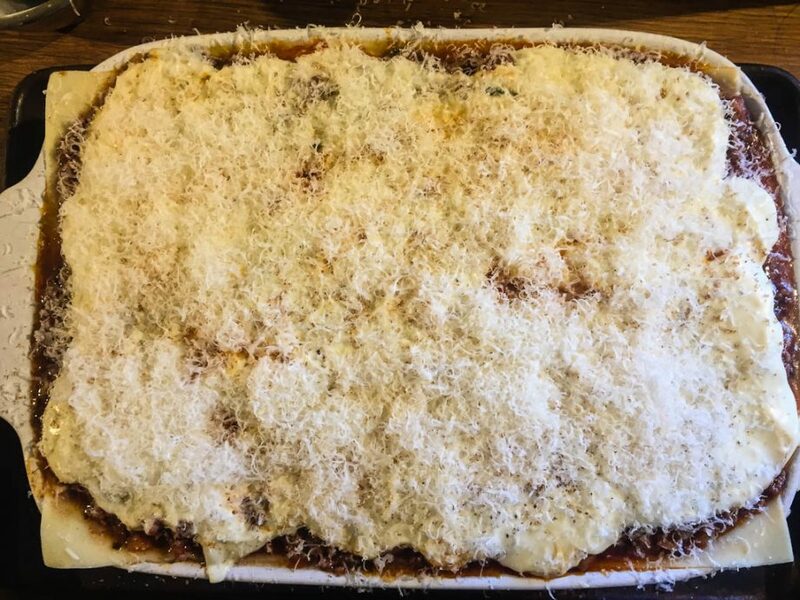 After doubling the quantities, there’s plenty of ragù left over, but still barely enough béchamel to complete the top layer. Finally, dust with grated nutmeg and a generous sprinkling of parmesan. It now gets baked in the oven, and when it comes out the top is blistered, bubbling and smells delicious. 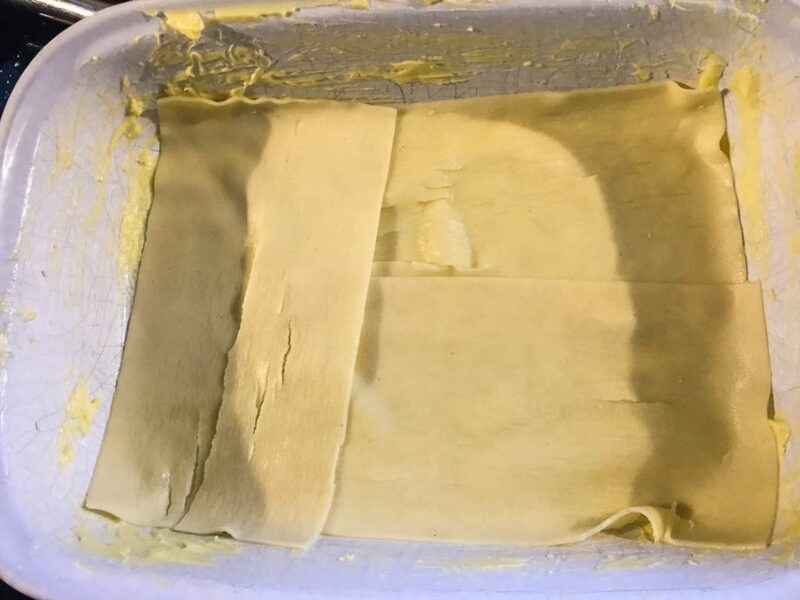 Now, the recipe says you can serve it straight out of the oven, or you can let it cool, cut into individual portions, and then reheat them in the oven. 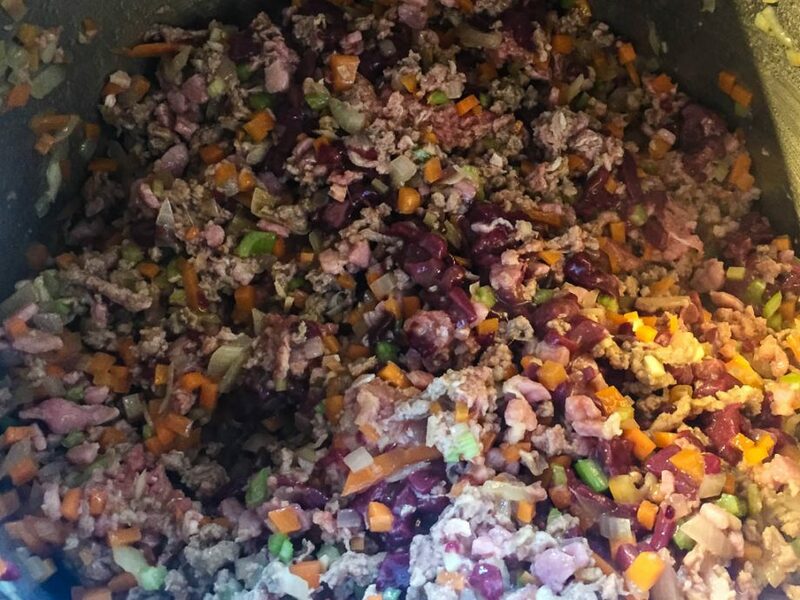 Serving immediately can be a bit sloppy – it’s tricky to get neat portions that way, as the insides are still fairly fluid. 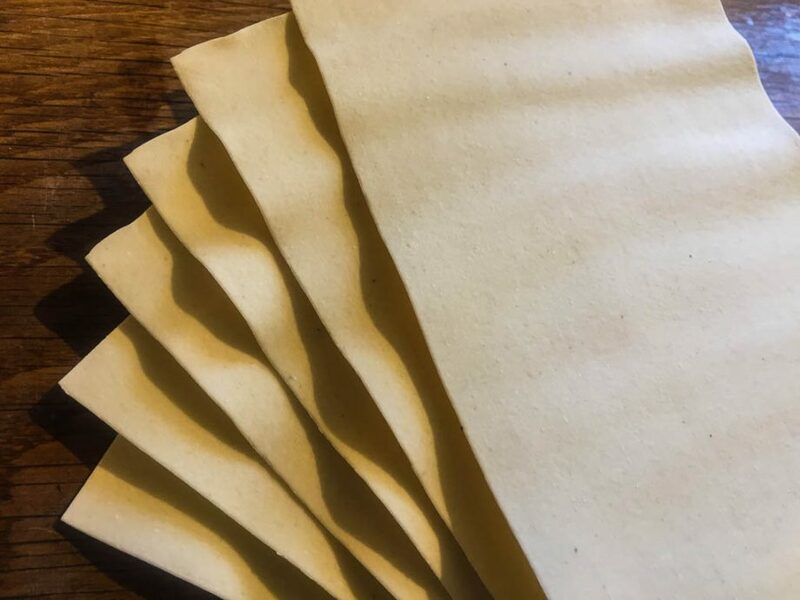 Cooling, cutting and then reheating, on the other hand, lets you keep a neat shape and all those external edges crisp up beautifully. I opted for the individual portions. 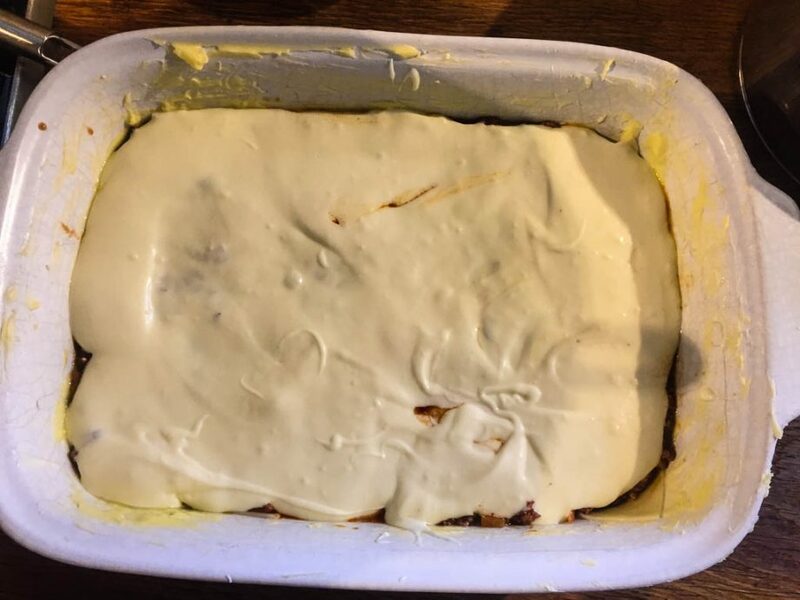 Once cooled, I cut two portions and put them on a baking tray – the first slice was trickier, and looked a bit rough. The second was much easier to get out. Once nicely reheated, I served them with asparagus and a salad. The lasagne was delicious, exactly as I remember it always being. It was rich and meaty, and soft and creamy, all at the same time. Cooling and cutting it causes it to retain structural integrity, so you can see all the individual layers on your plate, getting a little of each into each bite. Every mouthful was superb. 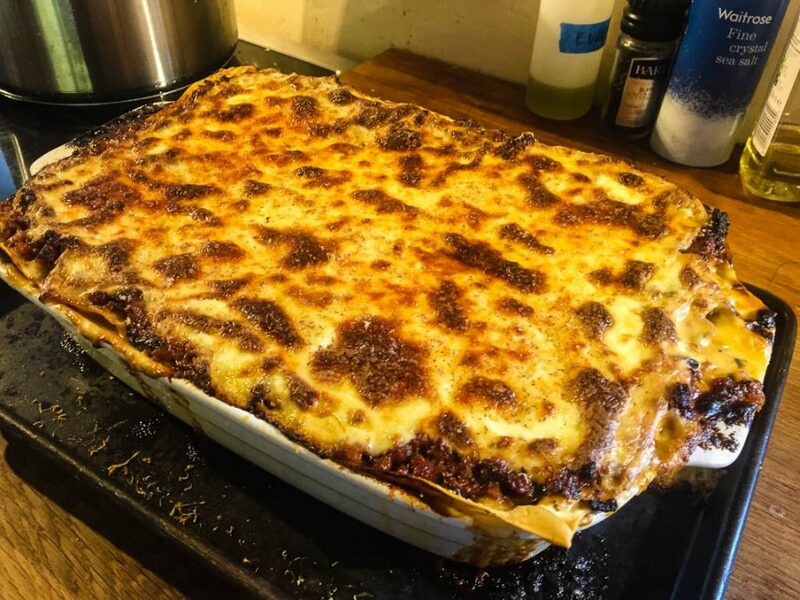 This lasagne is one of the recipes I remember with fond memories from long before Dave’s quest to cook all the recipes in The Prawn Cocktail Years. It’s unlike any lasagne I’ve ever had before or since. 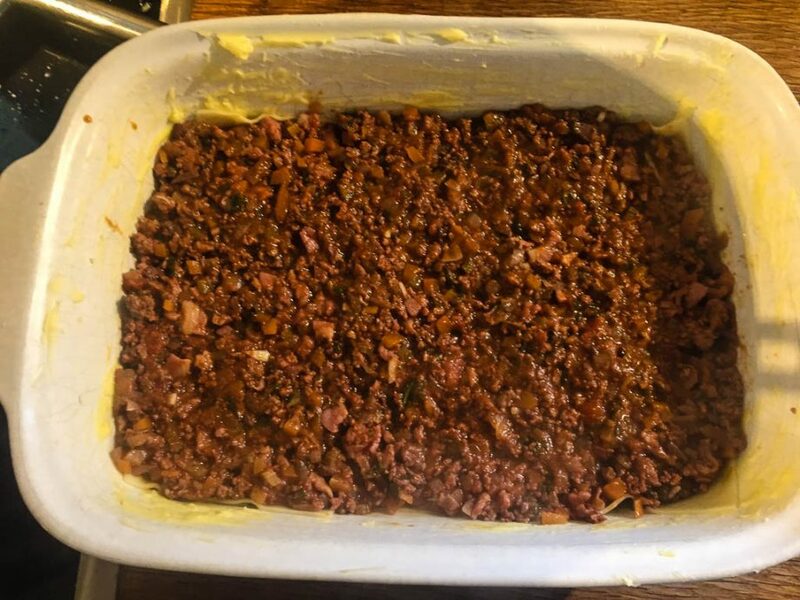 Probably because it uses a variety of meats, including liver, and most conventional lasagnes just use mince beef. The flavour is rich and creamy. The meal is definitely in the realms of comfort food. Best eaten in the winter I think. Tonight we had it with a little salad and the first asparagus of the season. The roasted asparagus was a worthy accompaniment. 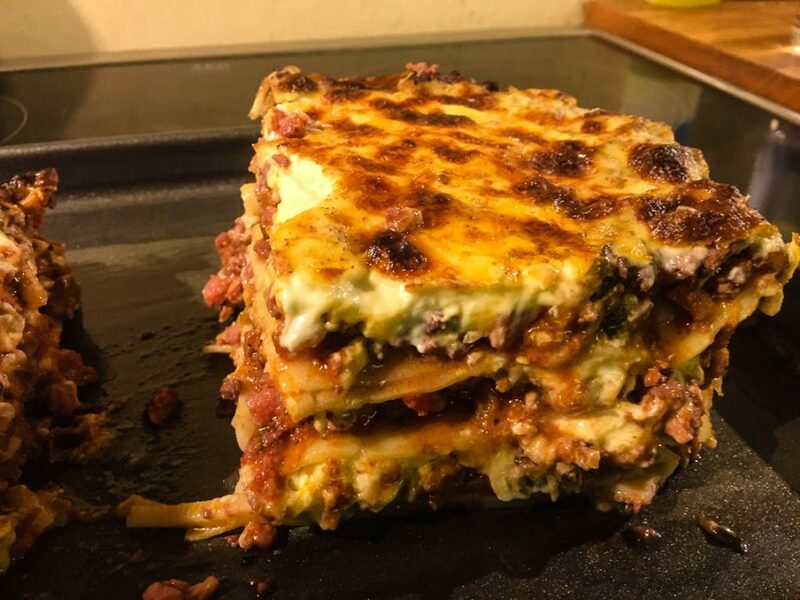 The thing I like best about this lasagne is the way all the layers meld together in the mouth. It’s not possible to segregate it into meat and pasta layers. It sort of melts. The liver makes it feel creamy. The sauce is soft and thick and silky. It has ruined me for lasagne anywhere else but at home now. Would definitely eat again, and fully expect I will as I often have in the past. A stunning dish, and one that I commend you on. 10/10 Francis Greene (TM) points are hereby awarded.